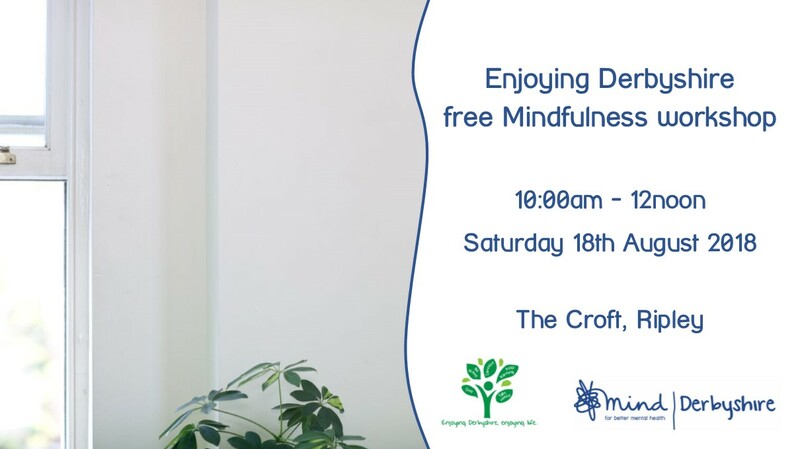 Find out more about Mindfulness and give it a go in this free taster session led by a Derbyshire Mind staff member with three years’ experience of hosting a group and delivering taster sessions. The total session will last up to two hours but will include three different basic mindfulness practices to help you explore mindfulness and find out what works best for you. Participation in the practices is by choice and you can opt out at any time. The workshop will start with an introduction to help you decide which parts of the morning you would like to participate in, and there be breaks between practices and chances to discuss every aspect of the practices being offered. There will also be a refreshment and comfort break. As the practices involve staying with what arises, mindfulness can feel challenging, so please get in touch if you have any questions before you come along. If you are interested in attending, please get in touch (details below) so we have an idea of rough numbers to expect and to complete an event registration form prior to the event. You are still welcome to join us if you haven’t booked in advance and we will ask you to complete the registration form before starting. This number is active on Monday, Tuesday and Thursday daytimes. Please leave a message with your name and number to request a call back outside of these times. It’s free, yay! We would like as many people as possible to be able to be able to join us as we believe that wellbeing is for everyone. As long as you’re comfortable it doesn’t really matter. You will be invited to take you shoes off as part of the practice if you would like to. This is voluntary and not essential. What if I’m late to the start of the workshop? If you are joining us after we start, we simply ask that you take a seat to the side and complete a registration form if you have not already done so and join in the next practice. I’m not very flexible, does that matter? Yoga body not required as chairs are available. Do I need to be religious or have a faith? No, whilst mindfulness and meditation have their roots in Buddhism, this is not a religious practice and can be used as an everyday tool for grounding. All Enjoying Derbyshire workshops and events are open to adults over the age of 18. I’m not sure if this right for me or if it will trigger me, what can I do? It can be challenging to be with your own thoughts and there is always the option to opt-out of the different practices or head to a quiet space away from the group. One of the questions on the registration form is an opportunity for you to make the facilitator aware of anything you might want us to know or could find difficult. If you’re not sure if it’s right for you, please get in touch to ask any questions. This entry was posted in Events and tagged Enjoying Derbyshire, Improving Wellbeing by Nicola Ward. Bookmark the permalink.